The Chinese Stripe-Necked Turtle, also known as the Golden Thread Turtle, has amazing coloration with striking golden stripes and an emerald and mahogany carapace (underside). 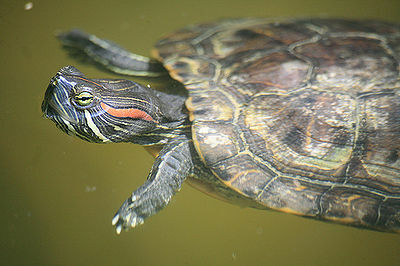 This turtle’s habitat is Eastern China, south to Vietnam, Eastern Laos and the islands of Hainan and Taiwan. It can live in temperate, sub-tropical and tropical climates and any type of fresh water accommodations. The Chinese Stripe-Necked is on the World Conservation’s list of Endangered Species due to human threat and encroachment of its habitat. Adults measure 5-7 inches for males, 7-12 inches for females. The face, neck and limbs have bright yellow stripes alternating with green, brown or black stripes. Fully webbed feet make them excellent swimmers. 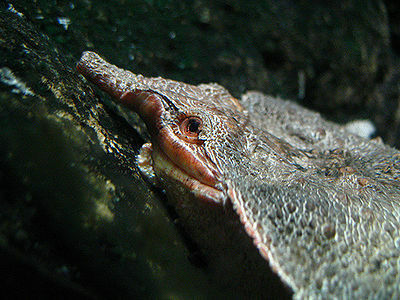 A full-size adult female requires at least a 100 gallon tank. Take care with accessories such as stones and driftwood to make sure the turtle doesn’t move them and become trapped. Keep water clean using a purchased water filter. Select lighting that includes UVA and UVB rays. A basking area to dry much be provided. Water temperature should be 75-80 degrees Fahrenheit. Basking temperatures are 85-90 degrees Fahrenheit and air temperature, 80-85 degrees Fahrenheit. As omnivores, the turtle’s diet should consist of high protein and calcium turtle pellets, greens and vitamins and minerals. Select a captive-bred turtle as they do better in captivity. With all turtles, lizards and this type of exotic pet, wash hands thoroughly before and after handling them to minimize the possibility of salmonella.